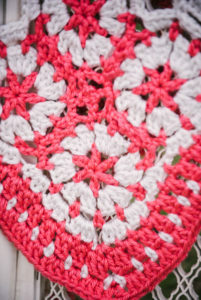 In all my crochet repairs I have learned some simple truths…there are points of crochet stitches that are more likely to break, disintegrate, or fail. Granted this is only understanding a “natural” break after wear or use, not the type of repairs that occur after the puppy finds a new toy in grandma’s afghan. Understanding where these points of natural breaks occur are really help in making repairs, and it also helps me understand how my stitches work together in the final fabric. 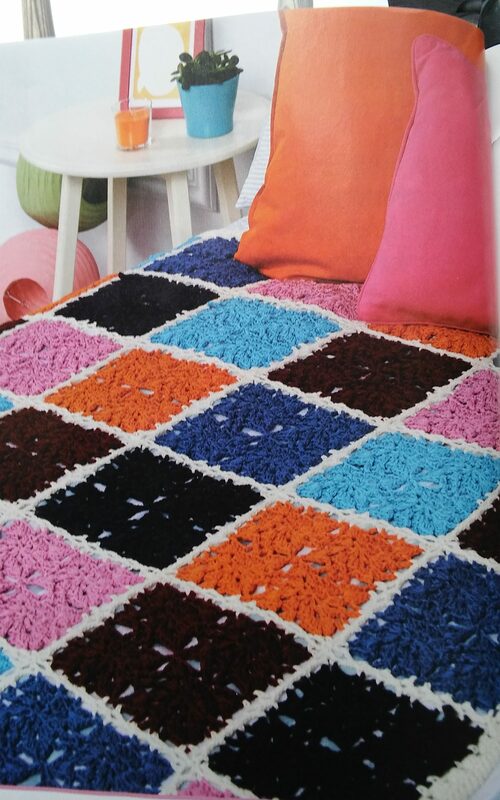 If you think of your crochet fabric as the construction of a building it is much easy to see that there are some points that are “load bearing” and where future repairs might need to happen. These “load bearing” points usually happen in a place that stitches are worked into. For example, the center of a motif is a classic area for a structural fail. Working multiple stitches in this one point puts a strain on the yarn, especially when the stitches are worked only over 1 strand of yarn. 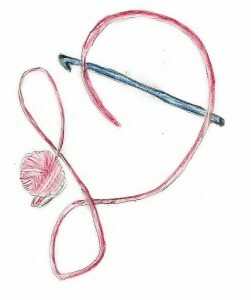 Working in one loop, either front or back loops, of a stitch also is a point of stress on the yarn. 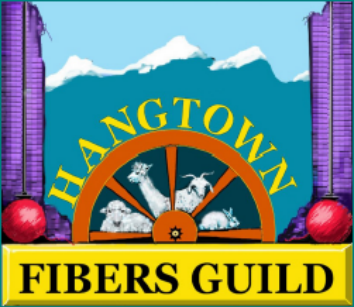 This one strand of yarn is bearing all the stress of any tugs or pulls, and depending upon the composition of the yarn, or the twist of the ply on the yarn, some fibers do not handle this stress as well as others. If you encounter these points of stress beginning to fail in your fabric, there are some simple ways to make the repair. The first step if to thread a yarn needle and catch all the loose loops from the base of the stitches that affected. After securing these loops, the next task depends upon the stitch that has failed. If it is a center of a motif, one can usually thread yarn around the join or center of the motif, working under all the stitches in the center and essentially creating a new center loop, and secure this new loop. If it is the top of another stitch that has failed, well this become a bit more of an operation. 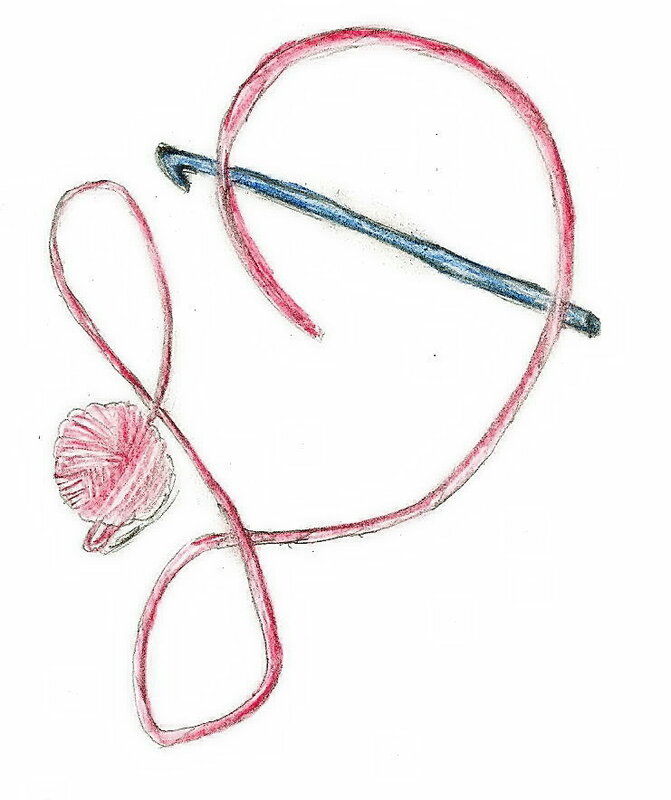 Dependent upon how damaged the stitch is, you may need to remove the stitch and re-stitch it, or simply catch its loose loops and using a threaded yarn needle “sew” in the manner of which the yarn would be pulled through if being stitched. This process takes a bit more confidence, and maybe some practice, but you can save history with a bit of patience. The best tip I can share for fixing the disintegration points, is not to attempt to work everything in one sitting. I find that I can only work for about 15 minutes at a time, as it is such focused work. Do not feel that it is a quick undertaking. Be patient, and it will come. The classics are classics for a reason. Crochet has some classic patterns and designs that always seem to draw people into wanting to learn the skill. A classic that I have had multiple students want to learn recently is the Granny Square. The Granny Square is really a motif, and there are times when motifs in general are called Granny Square. 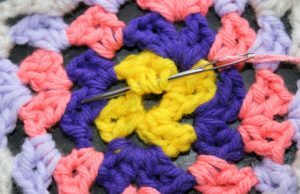 At this discussion I am simply referring to the classic look of Double Crochet (treble crochet in UK terms) groups worked into chain spaces. This makes what almost appears to be checker board of “closed” and “open” squares. The classic version has a different color on every round, and when the last round is worked entirely in single crochet (double crochet in UK terms) is worked in black. This is the way I was introduced to this classic, however today it is interesting to see it worked in all one color or worked extremely large. Chain 4, slip stitch to the first chain to form a ring. Round 4: With black color, slip stitch to any chain-3 space, chain 1, 3 single crochets in same space, *[single crochet in each double crochet across to chain-2 space, 1 single crochet in chain 2 space] repeat across to chain-3 space, 3 single crochets in chain-3 space ; rep from * around, slip stitch to beginning single crochet, finish off. Weave in ends. At this point the Granny Squares can be joined together to create any number of things. Following these simple rules you can create a Granny square of any size. 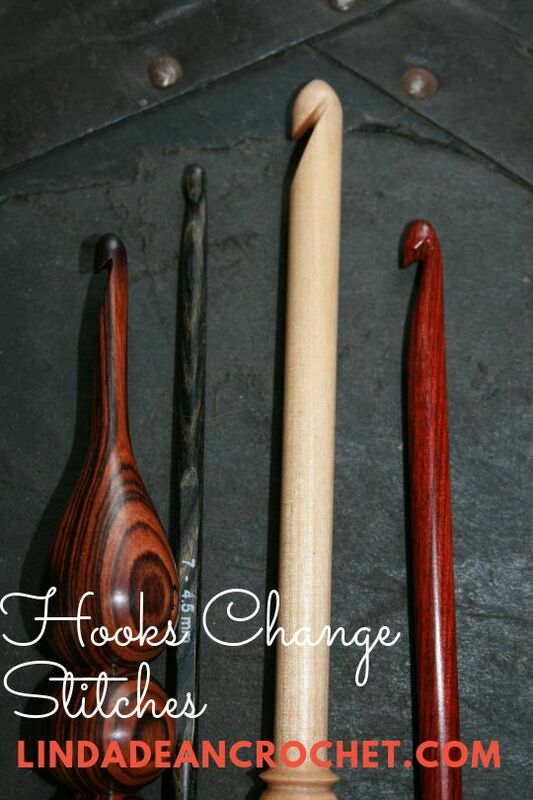 Then for the classic edge you work a round of single crochets, with 3 single crochets in each ch-3 sp, a single crochet in each double crochet stitch, and 1 single crochet in each ch-2 sp. 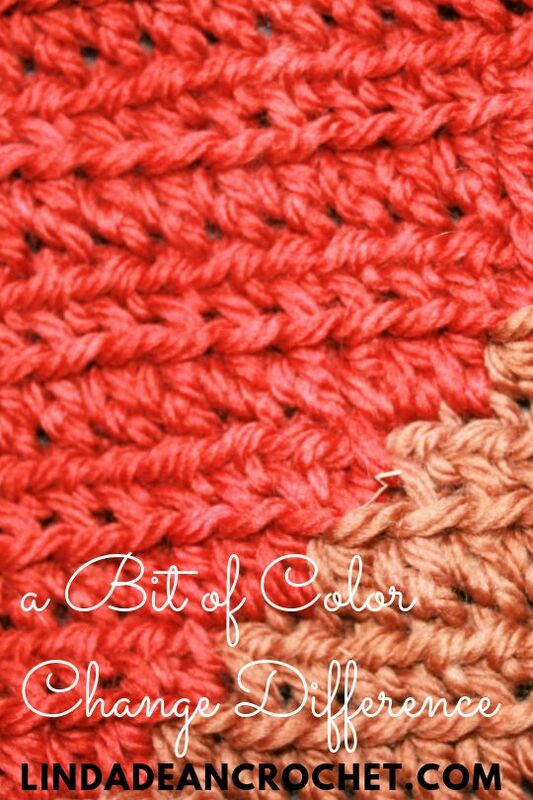 If you do not want to change colors every round, then after joining, slip stitch in each double crochet across to the next chain-3 space, slip stitch in the chain- 3 space and begin the next round. Check this classic out for yourself. It is always a fun morning when I learn that I have a new design out and published that I can share with the world. 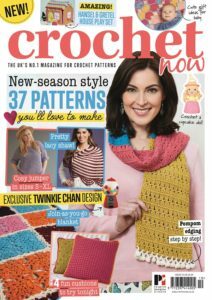 Today the Parisian Champagne Throw is available in the August 2017 issue of I Like Crochet Magazine is out and alive in the world. This throw actually started out in a smaller format. The motifs that I have designed, I originally considered for a thread table cloth. I have fun working up the little round motifs and thought they fit together a bit like clockwork. However after creating a square contaminating 4 of them I felt that they would be a really busy looking pattern for a table cloth. Thus they became a 4 square motif in themselves, and then joined with others. As is usual I have worked these motifs as “join as you go”, so there is no sewing or seaming needed. My decision to alter the original design from a thread table cloth, really was one of complete practicality. This design really works best with two colors and weaving in all the ends necessary for a table cloth…in thread…was a bit too daunting for me to consider. The design is worked up in a heavier weight yarn then you might usually consider, but this helps give it a practical picnic use for these warm months, while still giving a practical warmth factor for cooler months. It is pretty easy to find two colors that you enjoy together, and this throw works great with any of them. Personally I really like how the soft cream really allows the coral to pop, giving a comfortable and subtle contrast. 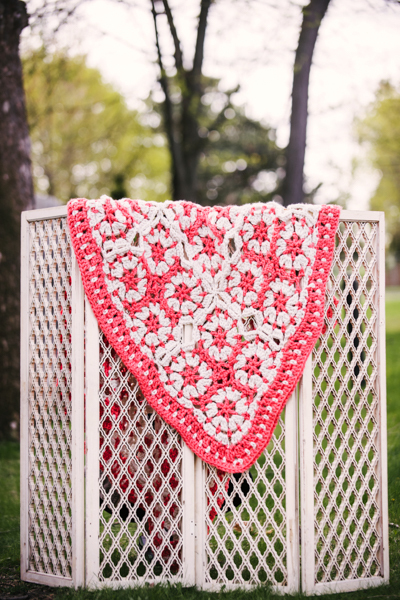 This throw can also be taken down a bit, attempt it in a baby yarn and create a memorable baby blanket, without having to worry about meeting the gauge, as the smaller yarn and hook will automatically adjust the motifs to a correct size. I hope that you give this throw a try, and share your progress with me. I still haven’t got a table cloth, but maybe the next design. When I was in high school, with my first car, okay a small truck, I had an “always prepared” bag behind the seat. The bag contained a coat, snow gloves, a blanket, a bathing suit, sun block, and a towel. Not exactly the same “always prepared” that I would think of today, but at the time you never knew what plans might arise for after school (especially if I had a day off work). It might be a trip to the mountains to play in the snow, or it could be a day at the river…really depends on the season and the weather, but I was prepared. Well, several years have gone by since then, but I still attempt to keep “prepared” kit in my vehicle…no longer my cute little truck that I would take 4 wheeling, but my much more practical Subaru Outback…I still refuse to admit it might be a station wagon. My kit now has some granola bars, napkins and wet wipes, a flashlight, and I still have a blanket. I find that this blanket has many good uses, and can even still fit in some spontaneity, like a quick picnic in the park, or what is more likely a fast food dinner during archery practice. The blanket also helps when the kids are tired, or someone is cold. It covers the seats when the dog goes to the vet, or is rolled into a ball to give the driver some more support for resting their arm on the console. This blanket has been replaced over the years, and one way I like to feel that I have a blanket that is really a second life is to make one. 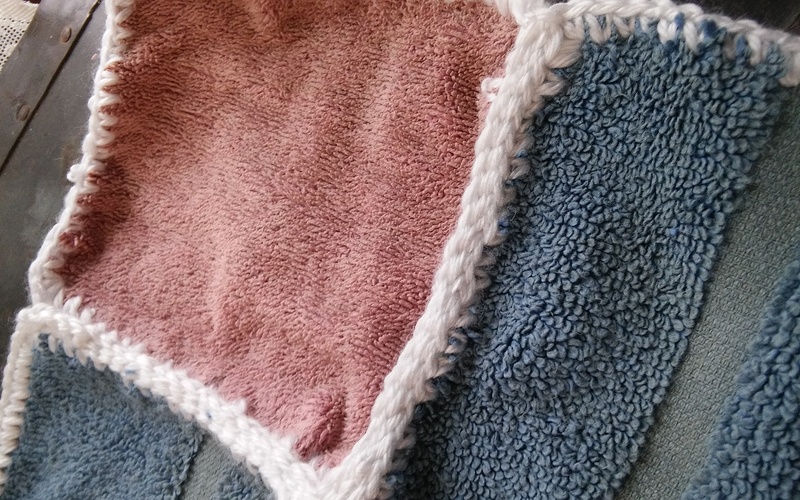 When bath towels wear out, become a bit thread barren, or simply have too many holes, I cut them into squares. As long as the squares are the same size, that is all that matters. I then crochet an edge around the squares. 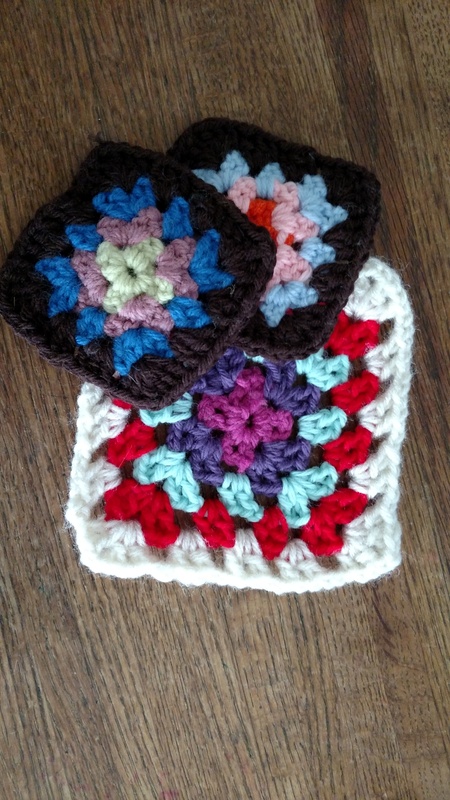 I then join all the squares together, I could sew or seem them, but I prefer to crochet them together. I find that the terry cloth a nice fabric for a blanket of the necessity, but just be mindful of ensuring that you slightly roll the edge of the fabric when crocheting the edge around it, this helps to reduce the initial fraying. Give it a try next time you have a towel that has seen better days, and create your own blanket to be prepared with. The Pinwheel Blanket is one that takes a little different approach then I usually do; it is comprised of small motifs that make a larger motif, then joined together. I will admit, I usually think a little more simplistic, I have a motif and that motif gets joined to other motifs, so making a motif out of motifs…well that is like an ah ha moment. I did not make this realization on my own, I had help. I often believe the best designs come out of a collaboration, ideas always grow when you listen to others…sometimes for the better, like this one. I had worked the smaller motifs together, mostly to see how they looked joined together as I think the join point creates a really interesting effect. 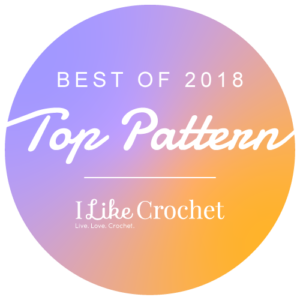 It was the editor of Crochet Now that mentioned that the block created looked great just as they were and should be treated like motifs, this allows the join point to become a highlight. This collaboration has opened my eyes to many different attachment and joining, sometimes it just takes a different view to open up a new world. So about Pinwheel Blanket, the initial small motif is only comprised of three rounds, so it works up quickly. It grew from a flower, and I feel it has a floral feel. It is at the join point that I see the pinwheel, with a feeling of the whirly-gigs I have seen in the garden. So I guess in a sense this throw has a garden feel for me. With flowers and whirly-gigs it does have an outdoor feel, and even the colors are bright like flowers. Each small motif is joined to create a square that is the bordered with a main color and joined to other squares, this creates a patchwork and rustic charm while in keeping with garden feel. This is a great project that can be worked as a portable, take on the go and create a fabulous blanket. Check this design in Issue 10 of Crochet Now.